Now in its fourth year, the complete GSI Report 2018 now comes in several smaller volumes, providing a greater level of detail and analysis, in order to better explain the specific impacts of sport. This approach will also allow us to continue to provide analysis and content in the same depth and more as in previous years, with each volume catering to the specific interests of our readers. The Event Hosting & Bidding volume is the first to be produced in 2018, which focuses on a) the hosts of events held in 2017, and b) the winners of event bidding processes in 2017. The Event Hosting & Bidding volume is the first to be produced in 2018. It focuses on a) the hosts of events held in 2017, b) the winners of event bidding processes in 2017; and c) the 2018 edition of the GSI Nations & Cities Index, which exclusively appears in this volume. Shedding light on the present-day problems faced by event owners and host cities in the lead-up to events. This focuses on an increasing rise in the number of host cities relinquishing their right to stage competitions, forcing event owners to re-open the bidding process for their events with a shorter than anticipated lead-in time. A complete geographical breakdown of the 80 events held in 2017, which took place across 123 cities in 39 nations. A comprehensive breakdown of the of 73 events within the GSI scope that were awarded in 2017, with details on some of the most high-profile bidding processes, including the Olympic Games 2024 and 2028, and the Rugby World Cup 2023. The latest editions of both the GSI Nations and Cities Index, announced in April 2018, are published in full exclusively in this volume of the GSI Report 2018. Featuring 587 cities from 88 nations, the index analysed 683 events across 155 categories in 81 sports, including summer and winter Olympic sports and Olympic ‘recognised’ sports across the 2012-2025 period. USA was once again named number one Global Sports Nation, while Tokyo, Japan ended the reign of London, UK as the number one Global Sports City. There are 72 world championships showcased in this chapter, as well as six multisport games and 2 continental championships, all of which are analysed in a standardised format, based on an increased spectrum of indicators than in the previous three editions of the GSI Report. The Global Sports Impact (GSI) Report is a product of the GSI Project and is published annually. The report aims to analyse and benchmark major events and their impacts using the GSI Methodology. The GSI Report was first produced in 2015, bringing together data and narrative from major sporting events from the previous year, covering economic, media, sporting and social impact pillars. 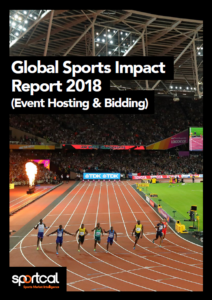 Pre-order your copy of the GSI Report 2018 (Event Hosting & Bidding) at a special early bird rate of £750 / CHF 1,000 / US$1,000 – contact clientservices@sportcal.com to find out more.